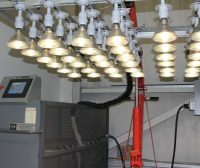 Ultraviolet solar simulators utilize a light source that replicates all or a portion of the UV spectrum of sunlight at the surface of the Earth. These systems have been developed to facilitate the analysis of the degradation and photo-aging effects of ultraviolet solar radiation on products such as full-size photovoltaic modules. 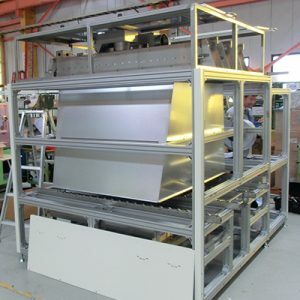 Our UV Solar Simulation System produces UV-B and UV-A light in the 280nm -400nm range with one to five sun equivalent irradiation over a 1m x 2m target area. This system is ideal for accelerated reliability testing of photovoltaic modules and other large products. 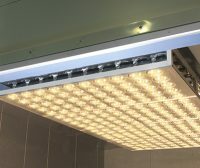 Please visit our page designated for Weathering Test Chambers for more information on that form of applied lighting system, or our page designated for UV Curing products for more information on that for of applied lighting system.